To win a race, you need to finish with good time. 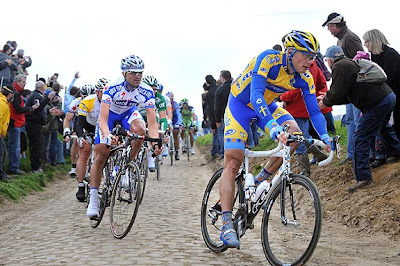 Having a mechanical in a grueling race like Paris-Roubaix will obviously take a huge chunk of time out of your advantage. So smart wheel choices seem the way to go. The norm for the Queen of the classics are strong, traditional box section rims with tubular tires, anywhere from 24 to 27mm in casing width. George Hincapie and Magnus backstedt both lost their wheels. Amazingly, George made it in 9th place but Backstedt wasn't so lucky this year. Backstedt wrote this on his website : "One hundred meters in to that section, I heard a big bang underneath me. I knew straight away what had happened. Only carbon fiber makes that noise. Then a couple of hundred meters later I heard the same noise again. I looked down and the wheels were all over the place. I was going slower and slower at the same time as I was trying harder. By the time I got out of that section, the race was more or less over for me." The questions linger. What were they both thinking when they decided to take deep section carbon wheels? Does sponsor pressure trump rider comfort? In other words, is there a subtle but selfish need on the sponsors side to get some air time on T.V in one of the biggest races of the Pro season that overwhelms sensitivity to rider needs. Or did the riders, looking at the fine conditions that day (since it wasn't wet, there's lesser dirt and mud to be clinging onto deep rims), decide to 'gamble' anyway and get some aero advantage (which I don't think makes much sense since much of the race is on cobbles and cross winds can be an issue). The other idea may have been that deep section wheels may be more 'comfortable' in the bone jarring 200 km ride than aluminum, or just a stupid thought that you'd look more cool in aero gear. It is my belief that any or most "perceivable" comfort is in the tires since that is way more flexible that the rims. Cycling Fans Anonymous ran a post today about a ZIPP engineer addressing the latest durability concerns on Bike Forums. The engineer seems to be dodging the idea that ZIPP wheels are the culprit. The bad 'luck' argument cannot play in since Backstedt broke both his wheels! It may be far too early to investigate the exact nature of the failure and its cause but it'll be interesting what ZIPP has to say more about this. CFA's blogger remarks, based on Backstedt's comments, that racing on ZIPP wheels given the manufacturer's seal of approval & 'confidence' means nothing and is basically just playing with dice. Choose equipment for your race and for your poundage. Makes me want to go back and watch the race again just to see how many others went with deep section wheels. That'll be no problem because I love watching that race. One needs to be careful with large loads AND high load/strain rates! Carbon is strong, just don't strain it too quickly or it will break. One must ask the question for Roubaix, what is the advantage of carbon wheels???? Like I said, I think traditional wheels are far better for a course like this, plus you don't have to trash around expensive equipment. Even if you do decide to race on something other than your sponsor's stuff, you probably will pay it out of your own pocket. Could it be possible that both of them thought that they'd breakaway and make a run for the velodrome on the last section, not really sure. I think there were several "forces" in play here. 1. Sponsor pressure. As you mentioned, Ron, this is a very real thing. It's a huge thing to be able to claim "The carbon wheel that won Roubaix!" After that, they can go on and claim how the superior aerodynamics, strength, and comfort qualities of their wheels played a huge part in the rider's victory. However, it's more about the motor than the machine. I love my aero wheels and feel they're pretty strong - but on rough roads I go with the ol' 32 spoke 3-cross wheels. 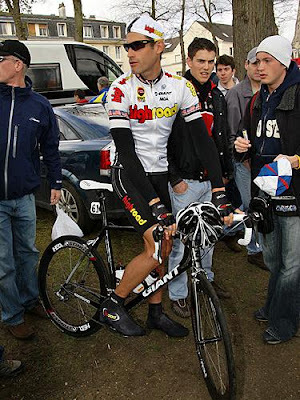 I hear Martijn Maaskant (slipstream) had 44mm depth 303 wheels from ZIPP that day. Nothing happened to him apparently and he got away in 4th. the sponser stuff in the cae of George is BS. Team Highroad doesn't have a wheel sponser. They use unlabeled Zipp wheels, Lightweight, shimano and in P-R HED stinger 50. Als don't forget Backstedt weight is around 90kg 220lbs and Martijn about 65kg. 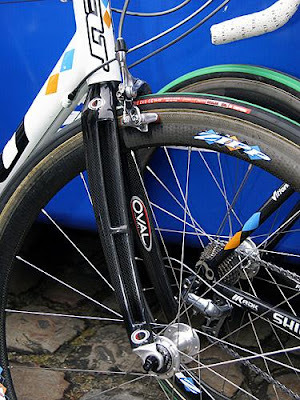 Also it makes perfect sence to use carbon hoops cause most of the race is flat tarmac! There is about 52 km of pave thats less then 1/5 of the race. And don't forget the aero advantage in the sprint on the velodrome or in a extreme solo effort. I have ridden the paris-roubaix cyclo-sportif myself without any mechanical troubles (besides the occasional flats. Hincapie decided to run his regular road bike setup because of the fine weather. His team and sponsor had built him a Paris-Roubaix special that had aluminum box-section rims, but he decided to leave it at home. I emailed the folks at Hed to ask about the failure. Andy at Hed claimed that Hincapie flatted on the Hed, then changed to a different wheel (not a Hed Stinger) - don't know what wheel - but that one broke a spoke. Thanks for this post. It's dead on and I've been saying this for the last week and a half. I want George to win Roubaix just as much as every other American cycling fan. I think he's a great rider and seems like a good guy. But the notion that this was just another case of bad luck for George is dead wrong. He picked the wrong equipment, which is especially disappointing because he was strong (and because he should've known better since he broke that steerer tube). Boonen won on box-section rims (for the second time). Ditto what Steve D said. Hincapie has a history of choosing equipment that differs from the tried and true, and I believe this is one of his fatal flaws. You'd think after crashing out with an equipment failure last year he'd have gone with a completely safe set-up this year. As soon as I saw his bike with carbon wheels, I knew his day was over.